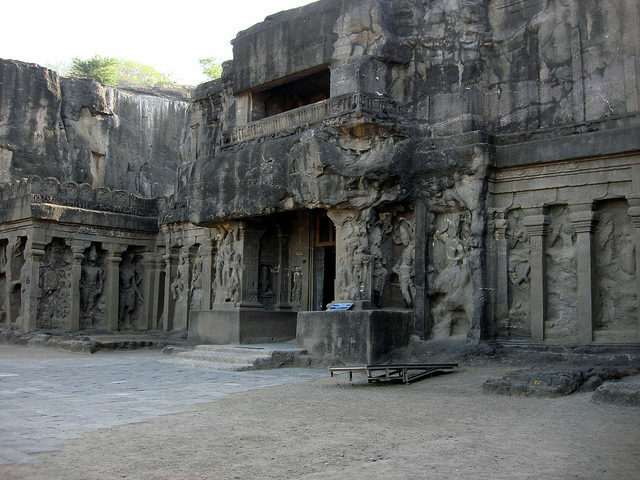 One of the largest and greatest monuments in India is the Kailasa temple. 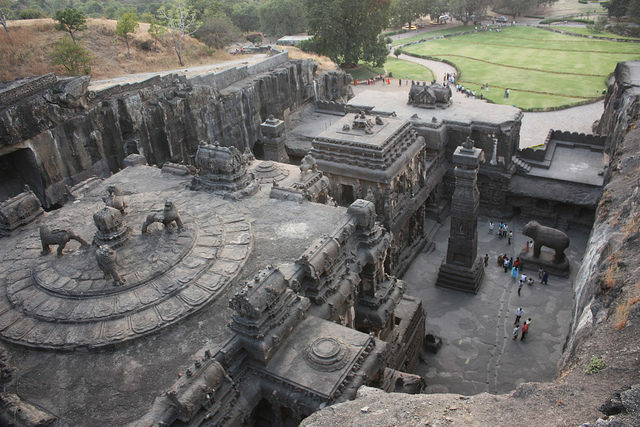 Located in Ellora, this astonishing Hindu temple was carved out of one single rock. It was designed to resemble Mount Kailash, which is the home of the god Shiva. 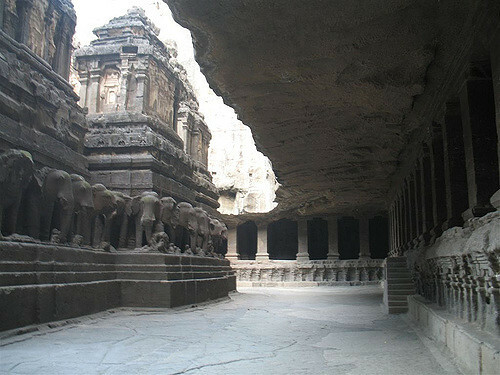 Kailasa is one of the most magnificent cave temples because of its unique architectural and sculptural styles. 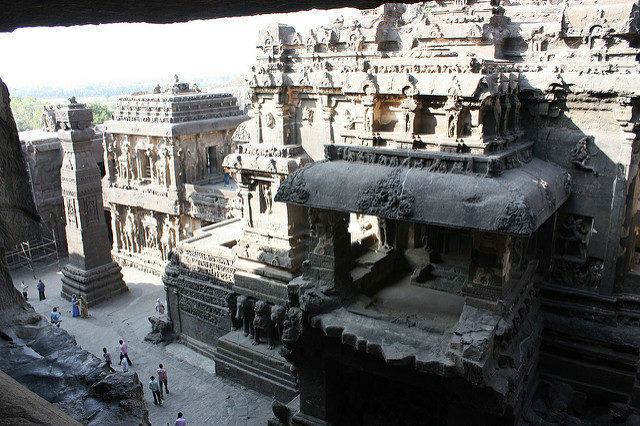 The temple is also known as the Kailasanatha temple and is one of the 34 cave temples and monasteries which form the Ellora Caves. Seventeen of them are Hindu, twelve are Buddhist, and five are Jain. King Krishna I built this temple in 760 AD, with different architecture from the earlier styles in the Deccan region. 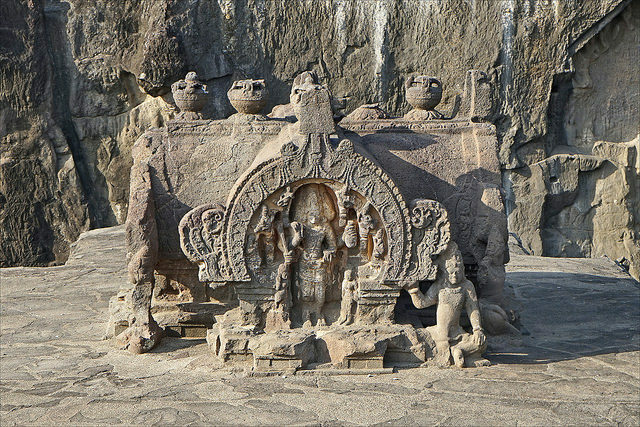 It shows some traces of influences from Pallava and Chalukya architecture. The king wanted to have his own Kailash, so when the temple was built, it was covered with white plaster which represented the snow that covers the Mount. The temple is unique because unlike other structures, this complex was excavated downward. During the excavation 150,000 to 200,000 tons of solid rock was removed. Many archaeologists say that almost 300,000 tons of rock had to be scooped out, which typically would take centuries. However, some historians believe that the temple was built in 18 years. There is architectural evidence that suggests that the entire structure of the temple was planned at the beginning of its construction. According to a medieval legend from the Marathi people of Maharashtra, at the time, the king was very sick. The queen prayed to Shiva to cure her husband, and in return, she vowed to build a temple in his honor and to observe a fast until the construction was done. The god Shiva granted the queen’s wish and her husband was cured. The architects were concerned about the queen’s fast because they knew that this kind of temple would take a long time to be finished. However, an architect named Kokasa assured the queen that he could build the temple in one week, so he began from the top and carved the massive stone downward. When the temple was finished, it looked like a magical underground place filled with various sculptures. which are followers of the old avatar Vishnu (Vaishnavaites) and the new avatar Shiva (Shaivaite). The construction of the main shrine is similar to the Virupaksha Temple at Pattadakal built in the 8th century. 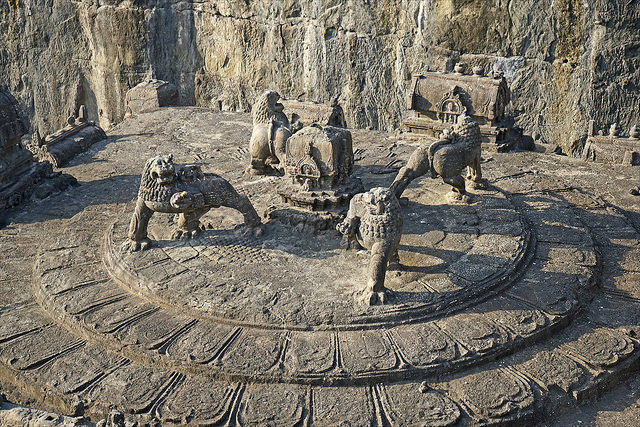 In the main courtyard, there is a monument to Shiva’s bull, Nandi. Elephant sculptures at the base of the temple make it look like they are holding up the whole structure. Carved and painted in the base of the temple hall are scenes from the epics Ramayana and Mahabharata. Among the depictions, there is a striking sculpture of King Ravana attempting to lift Mount Kailash. There are also several detached shrines around the temple, three of which are dedicated to Yamuna, Saraswati, and Ganga, the river goddesses from the Hindu mythology.